When I was a kid, Easter Sunday meant a we’d be doing things a bit differently than the typical Sunday. More specifically, it meant three things: suits, special music at church, and great food for lunch. And yes, of course--we were celebrating the risen Christ. But as an elementary school kid, I had not yet grasped the full meaning of the event. It was about Jesus. It was Easter. The tomb was empty and we had to dress up. Mom made sure my brother and I looked our best and as we look back on it, at the ages of 8 and 10, I can’t imagine mom getting us into suits and ties. But she did! Easter has always been the most special day of the year as a Christian. While Christmas is vitally important, Easter completes the story. Easter provides the evidence: they’ve never found His body, and they won’t. He is risen. The older I get, the more important Easter becomes. With each passing year, it is more meaningful, powerful, overwhelming, real, and gut-wrenching. At ten years old, the resurrection story was illustrated on a flannel board. It was a page to color, or something to act out in a drama presentation. It was meaningful to know at a young age God loves me. It was an amazing concept that someone would die with me in mind. Later, in my teenage years, it all began to make sense to me. I am so thankful my parents made sure I was in church, that I was hearing the story over and over again. When the age of innocence passed, it was good to have the story in my mind. It was good to know that forgiveness is possible. Our Easter celebration at Crossings a few weeks ago looked very different than the ones I experienced growing up; some of the music was the same, and we did have some great food after church when the family gathered to celebrate the day. But there weren’t many ties and there were no flannel boards in the children’s classrooms. The auditoriums were accentuated with mega video screens, bright lights, life-changing video, and every musical style you can imagine. I’ve always felt that a church ought to pull out all the stops at Easter and do the very best they can with what they have to work with. I’m so proud of and thankful for the ministry team I serve with. They created an unforgettable experience for our church on Easter. We started on Maundy Thursday with two services. Terry Feix walked us back through history in a way that made the story come alive--it was as if we were right there. We shared communion together and the music and worship created a very peaceful worship experience. 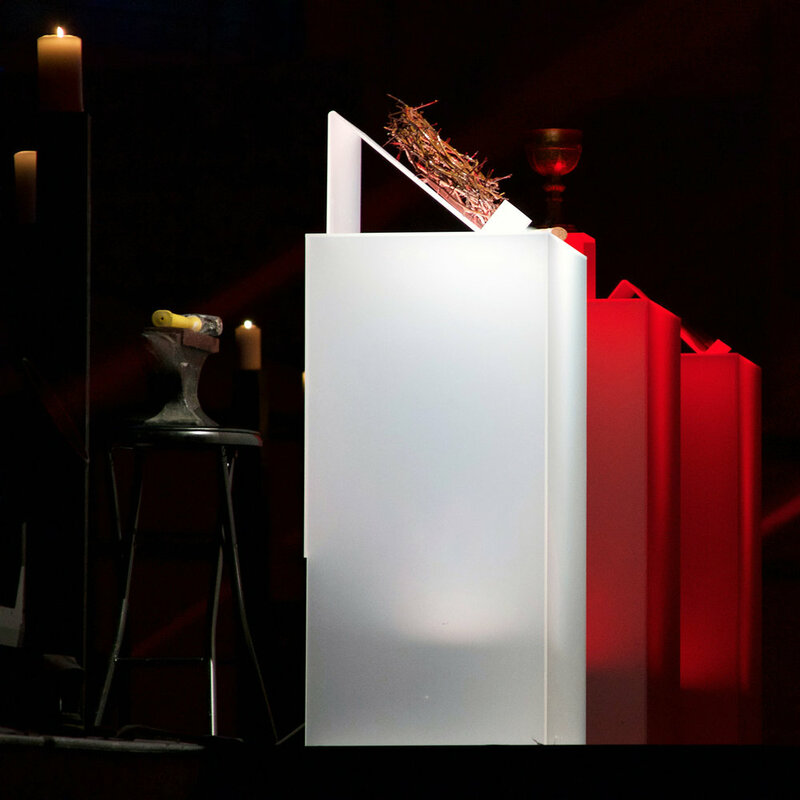 On Good Friday, we offered two services that were in some ways terrifying, as they were meant to be. When a Good Friday service begins with Larnelle Harris singing “Much Too High A Price,” you know you are in for something special. We read from the Bible. Sandi Patty sang “Via Dolorosa.” Three stories were told: the 30 pieces of silver, the meaning of the cup, and the hammer and spikes. The objects of these stories were on brilliant display center stage. I told the story of the 30 pieces of silver and it was hard to get through it. Judas sold out Jesus for the same price paid for a slave fatally injured in a farming accident. As I prepared to tell this story, I reflected on those times when I also sold Him out for something worthless, selfish, and self-centered. How I wish I could forget those moments when I settled for the temporary instead of the eternal. When we all walked off stage, Larnelle commented that he had just experienced the most intense forty minutes of his life. We all needed some space to reflect, to cry, and to pray a prayer of thanks. And then it was time to celebrate the empty tomb. We experienced powerful services across five worship centers, and there are simply not enough words to describe them. It is my life privilege to be led in worship each week by four worship leaders: Don Peslis in our Chapel, Josh Edington in our OKC Venue, Larry Harrison in our OKC Sanctuary, and Cole Grubbs in our Edmond Venue. One special moment in our service was when we welcomed the nearly 200 men at Joseph Harp Correctional Center as our newest satellite site. Our congregation went crazy! Standing ovations. Yelling, shouting, applauding. The men at Joseph Harp later told us how much it meant to them to be a part of our family, and how special and loved we made them feel. It has been 49 years since my tenth Easter on the planet, and the story gets more overwhelming to me because I am more and more aware of my sin, the hopelessness of life without Christ, and the love demonstrated by Jesus.